We found a nice campsite along Lake Fagnano a couple of days ago. 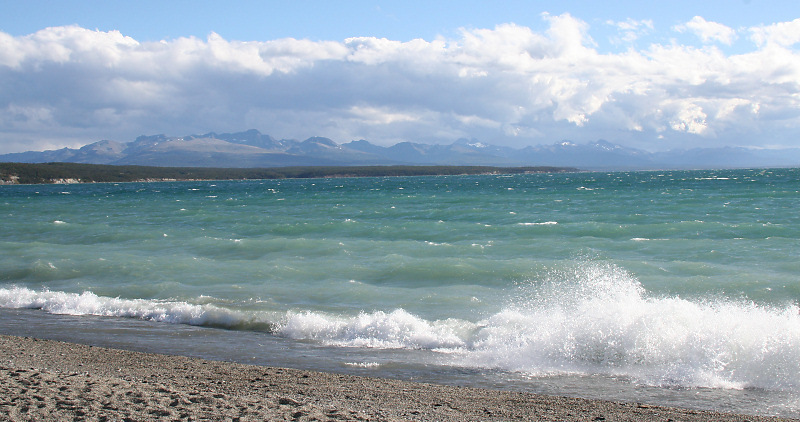 The view was beautiful, but like the rest of our trip down Patagonia, the wind was blowing very hard. We don’t have a wind gauge, so I can’t give you a precise wind speed, but I can tell you it was strong enough in the gusts to blow the tops off the waves. OK, I don’t care if it’s windy – that’s why I keep my hair short and chilly beats 14 below wind chill. Yes, I am totally jealous!!!! Keep enjoying yourselves because I’m enjoying it too!!!! Sure reminds me of Waterville !!!!! I can’t believe that you didn’t put a wind guage on your rig!!!! I assume you have no fishing equipment either. 1. From Barb: OK, I don’t care if it’s windy – that’s why I keep my hair short and chilly beats 14 below wind chill. Response from Steph: Yup, that whole short hair thing is looking better and better every day! And, who knows, I might even be “embracing the grey” I have soon! 🙂 As for the cold, sounds like you need to move somewhere warmer! 3. From Keith: Sure reminds me of Waterville !!!!! I can’t believe that you didn’t put a wind guage on your rig!!!! I assume you have no fishing equipment either. 4. From Lee: Good writing, good photos. Response from Steph: Just a couple of this man’s many talents! Be sure to throw a few lines of Spanish in next time you chat with him…he’s picking up the language! Thanks to everyone who has posted. It sure is great to hear from everyone back home – we miss you all! Pure drama amigos–I’m so damn jealous. Traveling through that region on a motorcycle was a vacillation between “Darwinian” dream-state and nightmare battling those ferocious elements that eliminate all but the few determined adventurers. A constant 45 degree lean meant little opportunity to do more than focus on 2,500 miles of soft pea-gravel and the lateral tug of war of brutal 80mph crosswinds. Thanks to your eyes and words, I’m seeing more of Patagonia through your photos than actually riding there. I’m certain that your campfire caused damage to the bio-shere causing the strong wind gusts and the unnatural red dusk. You must trade your travel rig in on a proper Prius – after all, my sone tells me that they can go over 100 MPH on PCH. PS: Avery says excellent images and what was the wine? Sorry – me bad spelling. I blame it all on Jimmy….